As if the Hello Kitty Hotel wasn’t pink enough, Barbie is now the guest of honor at the Double Tree by Hilton Hotel Cariari in Costa Rica. Bringing the fantasy of living in the doll’s dream house to reality, the world-class hotel has introduced a new Barbie themed room hat pays homage to her pink divalicious world. As one would imagine, it’s filled top-to-bottom with Barbie-themed linens, clothes, costumes, games, dolls, movies, and accessories galore. 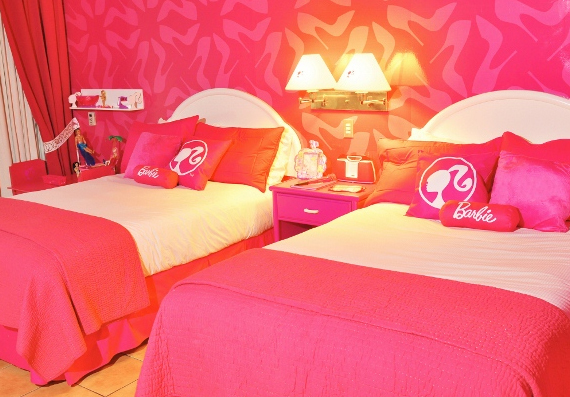 The Barbie room is available for $139 per night (two-night minimum), and includes breakfast for two children. The room is attached to connecting parent’s room, which starts at a rate of $109 per night for a king-size bed. So if you’re an adult and you want to stay there, you should feel really lame, because you’ll have to bring your parents with you.